This Regency All Night Burner Kit uses solid fuels such as coal and wood to fuel the fire that will help to heat your home and make it nice and cosy. The complete set comes with a bottom grate, an ash pan, a fret, and an operating tool. The all night burner fits into a standard 16 inch fire back. 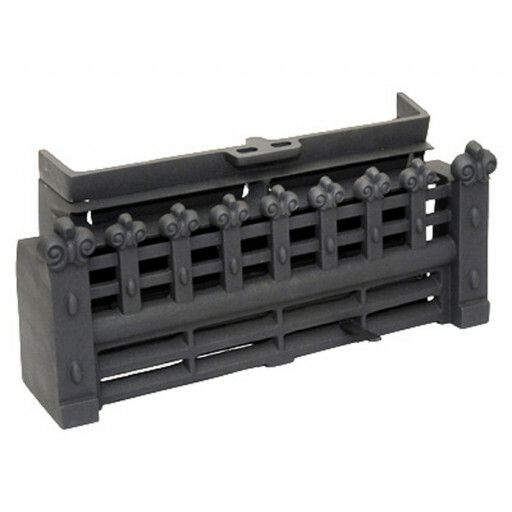 The grate is made from cast iron and has a matt black finish. All night burners are designed to allow you to have better control of the size of the fire and how quickly it burns. The users adjust the air intake by opening or closing the front and bottom of the all night burner. With more airflow going through the grate, the fuel will burn more quickly and make a brighter, hotter fire. With less airflow through the all night burner, the fuel burn more slowly and the fire will burn for a longer period of time without going out, heating your room throughout the night. Modern smokeless coals are especially good in these grates for all night burners. Excelent service , over the moon with my new Regency all night burner , works a treat .